If children have outgrown or otherwise no longer use their bunk beds, there's no need to discard that large piece of furniture. Taking it apart and reassembling its pieces offers a way to create new furniture, or leave it mostly intact to create a play or study space. The mattresses can be reused as well, and are a suitable size for a daybed. If children have outgrown or otherwise no longer use their bunk beds, there's no need to discard that large piece of furniture. Many bunk beds are made of wood planks -- a lot of wood planks. Take the structure apart completely, saving the hardware, then reconnect the pieces to make benches and chairs. Some pieces you may not even have to cut; the long boards create a long back and seat for the bench, while short pieces form armrests or legs. Reuse the hardware to connect some of the pieces. Leftover scraps can be turned into a step stool. 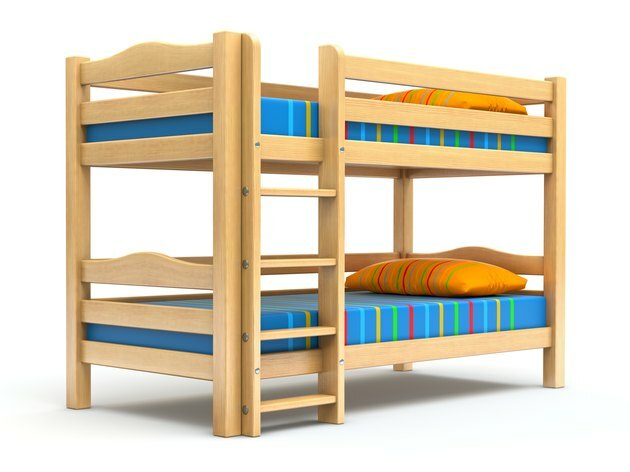 Remove the bed and frame from the bottom part of the bunk bed for a nice private space. For a teen, place a desk or chair inside the nook, covering the rest of the frame with sheer fabric, or dark fabric for a more private environment. Extra space inside can be used as a makeshift closet with the addition of a closet rod. For a child, paint cardboard to look like castle walls and tack those up to the frame. The inner area can be a castle interior or dungeon. Cardboard cut to look like turrets hides what was the top bunk. The top space can be used for storage or a secret play hideaway. A twin mattress is well suited to new life as a daybed. Keep the bottom bed frame and mattress intact, but remove the entire top bed structure and tall posts. Place an upholstered headboard behind the long side of the bottom bed for one style of daybed, or use the planks from the bunk structure to create a back for the daybed. If the back is tall enough, the second mattress can serve as cushion for the back; just upholster it onto a sturdy backing, or strap it to a wood backing and cover it with fabric so it no longer looks like a mattress. Move that bunk bed outdoors after removing the mattresses, then repurpose some of the lower planking to create a full, solid floor and partial walls for the top. The former top bunk is the new play area, like an open-air tree fort, sans tree. Add a climbing rope and reuse the old bunk ladder as a means to climb up. Paint the bunk a cheery color, or simply seal it with an outdoor polyurethane to withstand the elements.